1997: Posse-O - "It's Up to You..."
1998: Powerule - "Heatin' Up"
1998: Powerule - "Rhymes to Bust" / "It's Your Right"
2001: Nikka Costa - "Like a Feather"
2002: J-Live - "School's In"
2004: Daniel Merriweather - "City Rules"
2004: Daniel Merriweather - "She's Got Me"
2005: オール・ダーティー・バスタード - "Dirty Dirty"
2005: Rhymefest - "These Days"
2005: Rhymefest - "Brand New"
2006: リリー・アレン - "Littlest Things"
2007: エイミー・ワインハウス - "You Know I'm No Good"
2007: ロビー・ウィリアムズ - "Bongo Bong and Je Ne T'Aime Plus"
2007: エイミー・ワインハウス - "Back to Black"
2007: クリスティーナ・アギレラ - "Slow Down Baby"
2007: Candie Payne - "One More Chance"
2007: エイミー・ワインハウス - "Love Is a Losing Game"
2008: アデル - "Cold Shoulder"
2008: Leon Jean-Marie - "Bed of Nails"
2008: カイザー・チーフス - "Never Miss a Beat"
2008: Wiley - "Cash in My Pocket"
2008: カイザー・チーフス - "Good Days Bad Days"
2009: Daniel Merriweather - "Change"
2009: Daniel Merriweather - "Red"
^ Westbrook, Caroline. "Mark Ronson interview". Jewtastic. July 2, 2007. ^ Coyle, Jennifer. "Introducing ... Samantha Ronson DJ/singer-songwriter". The Observer. Guardian. December 12, 2004. "Ooh Wee": (PDF) The ARIA Report: Week Commencing 19 January 2004. Pandora Archive. (7 February 2004). http://pandora.nla.gov.au/pan/23790/20040207-0000/Issue725.pdf 2015年1月17日閲覧。. "Stop Me": (PDF) The ARIA Report: Week Commencing 2 July 2007. Pandora Archive. (20 July 2007). http://pandora.nla.gov.au/pan/23790/20070720-0000/issue904.pdf 2015年1月17日閲覧。. "The Bike Song": (PDF) The ARIA Report: Week Commencing 4 October 2010. Pandora Archive. (11 October 2010). http://pandora.nla.gov.au/pan/23790/20101011-0000/Issue1075.pdf 2015年1月17日閲覧。. ^ "Canadian digital single certifications – Mark Ronson – Uptown Funk". Music Canada. 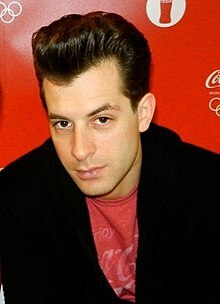 ^ "New Zealand single certifications – Mark Ronson feat. Bruno Mars – Uptown Funk". Recorded Music NZ. Retrieved 1 May 2015.